This appetizer takes about an hour to make (we made 7), but you also have to leave it in the fridge over night. If you’re impatient or in a rush, I think 2-3 hours may do. Step 3. Grab whatever cups, glasses, bowls, etc. you’re going to put all this stuff into. 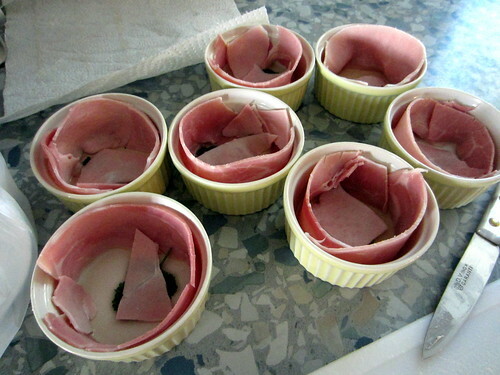 Cut ham into rectangular slices and place them inside each cup/glass/bowl so as to cover the rims completely. If a piece is too short, just add another piece to cover the exposed side. 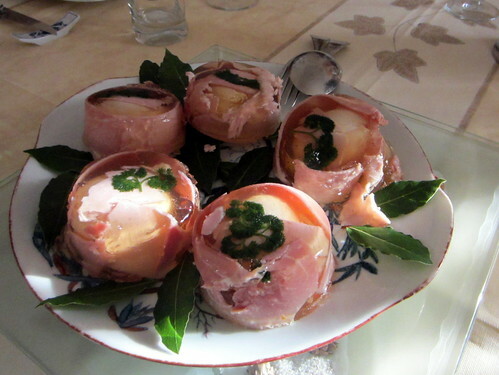 Put a sprig of parsley in the bottom, and then put a square of ham on top of it. …and pour the warm gelée on top. Step. 5 Put in the fridge to cool overnight. Step 6. My grandpa came around wanting to take pictures so I put him to good use =] you’ve got a video to show you how to get the oeufs en gelée out of your cup/glass/bowl (anyone else sick of the repition?) 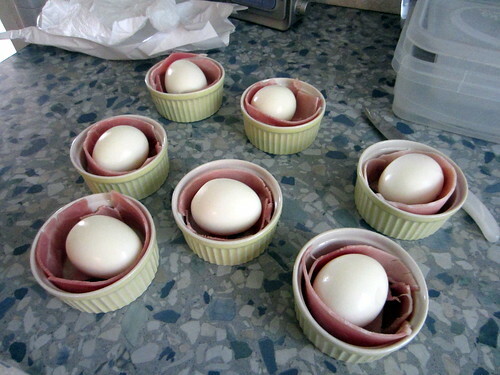 Stick them in warm water to help melt the sides a little, then slide a knife around the perimeter (inside the cup, mind you), then flip it upside down and slide it out onto a plate.